Today we move into June. So much closer to Christmas! For many people the month of June brings one thing to mind- brides. So much excitement about the June wedding and the fun of early summer nuptials. I challenge those planning a wedding to rethink their plans. 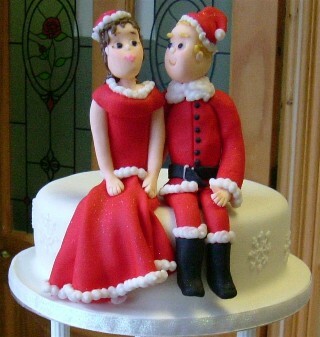 Winter weddings can be great, and a Christmas time wedding- even better! I know what lots of people are thinking- “What? Why would you do a wedding then? It’s cold and dark and no fun at all”. WRONG! It may be colder and the sun may set earlier, but fun is definitely part of a winter time wedding. I participated in my first Christmas wedding as a groomsman many years ago. The wedding was for a great friend and was held on a Saturday evening near Christmas. It was a beautiful clear cool winter night. As soon as you entered the church you immediately felt all the warmth, happiness and love that you connect with Christmas. The church was completely decorated in it’s Christmas finest and the wedding added special touches for the night. Candles were used with low lighting to set the perfect mood. The bridesmaids wore beautiful bright red dresses and the gentlemen wore classic tuxedos with green and red tartan bowties and cummerbund (still have those today). I still recall this night as one of the best weddings I ever attended. It combined all the wonderful aspects of Christmas- family, celebration, hope, happiness, and love with the start of a new couple’s life together. If you plan to pull off a Christmas you need to get started ASAP. It is such a busy time of year and planning the perfect ceremony and reception will require your best efforts. A basic google search will give every wedding planner thousands of ideas for winter weddings and how to change things up to go with the season. 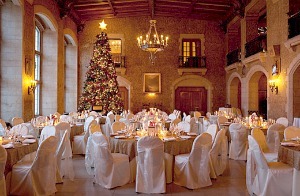 Every part of the wedding could have a little, or big, Christmas touch. The invitations could be a play on the traditional Christmas card, maybe a variation of some type of vintage winter travel poster, or your own unique idea- a letter to Santa? Favors might be a the perfect way to show some Christmas creativity. You could do the obvious ornaments. More interesting would be little stockings stuffed with candies or treats, mittens, silver bells, or maybe even wool socks. The food and drink for the special day can reflect Christmas too. Starting out with cookies and hot cocoa when the guests arrive. Eggnog, hot cider, spiced rum, and holiday punch for drinks. Finish it off with a complete Christmas dinner- Turkey, dressing, and cranberry too! 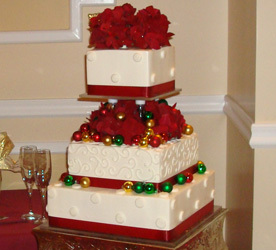 The cake could be decorated in a wintry look with silver and white, or the more obvious red and green. The more adventurous couple might go with Santa and his sleigh, a stack of gifts, or might I suggest a Yule Log. Decorations will be fun too. Most churches and reception locations will already have some type of Christmas decorations up at that time of year. You can easily add to those to create your own look. Flowers and centerpieces might include lots of pine and evergreen. One idea I saw used vases made out of ice with loose pine and wild roses in them. Your music could include all types of Christmas details too. Reception music could be all types of carols and the dance music could be more upbeat holiday tunes. Christmas music can be part of the ceremony too. That December wedding I attended used Joy to the World as the recessional- perfect! Don’t forget about the honeymoon. A wintertime Christmas wedding means the honeymoon could be off to a great tropical location or to an amazing mountain ski resort. I hope everyone gets a chance to celebrate a wedding at Christmas! Well the first snow of 2012 here in Frederick really didn’t amount to much. Couple inches of slushy snow with some ice on top. No winter wonderland. No days of work. No hunkering down and digging out. Too bad. I love snow. I love winter. I plan to retire to the north coast of Maine where I can stand on the shore and see the ocean spray freeze. I know most don’t share this love of snow and winter but everyone loves a beautiful snow-covered Christmas scene. As Natalie shared yesterday, the likelihood of a white Christmas is pretty slim around these parts. We have to take advantage of the snow when it comes. Here’s a holiday hint for the rest of winter. Keep a camera handy! When the snow does come for real this winter snap some pictures. Get those shots of places and things looking all wintry white. Use these pictures to create holiday gifts. 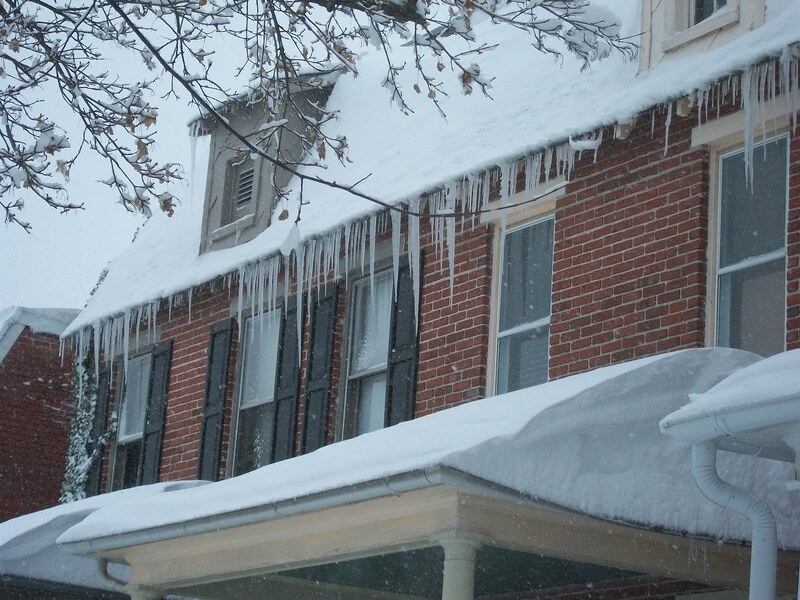 One idea- get the perfect photo of your childhood home in winter glory. Find a unique antique frame or other display for it. Give it to your parents with a card or note recalling a fond memory from Christmases growing up. Another idea- Get shots of the kids out sledding and playing in the snow- makings of a great shot for holiday cards over those posed sweater shots. One last idea- take pictures of scenic wilderness or wildlife in the snow. Use them to create a calendar of local scenes. A great gift for family and friends who have moved away. Get those cameras ready and think snow!! !